Veronica’s parents were married for twenty-six years. They may have been in a rut, but they seemed happy enough. Veronica’s dad is a lawyer and her mom stayed home – at first raising the kids and then caring for her and her husband’s elderly mothers. While the roof is being repaired, Veronica’s father comes home to discover one of the roofers asleep on his bed, wearing only a pair of pants. Veronica’s parents end up getting a divorce. Veronica is a junior in college, and working as a resident advisor, at the time and her life seems to spiral out of control after her parents’ divorce. She is devastated by the divorce and has a lot of trouble coping. Veronica makes one poor decision after another and doesn’t seem to know how to get her life back on track. When her mother shows up at her dorm with problems of her own, Veronica thinks matters will only get worse, but soon discovers some new things about herself and her mother. 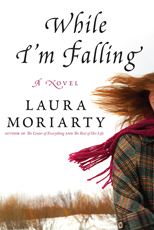 While I’m Falling by Laura Moriarty is the story of a family that has fallen apart. The family has been struggling for years, but Veronica has been too self-absorbed to notice it, and the story is told from her point of view. Her parents’ divorce just throws her for a loop. I thought Veronica was a great character and very realistic for someone her age. She was struggling with her job, school, and trying to grow up and just couldn’t handle one more thing piled on. Yes, a lot of her problems were created by her own poor decisions, but I think that’s pretty common for twenty year olds. I thought Veronica’s mother was true-to-life as well. She had spent so much of her life taking care of others that she didn’t really know how to take care of herself. Veronica’s father came across as a jerk to me, but maybe I was seeing things from a female perspective. Parts of While I’m Falling are pretty sad, but I didn’t really come away from the book with a sad feeling . I enjoyed this book and actually felt a little hope by the end of it. Review copy provided by Amazon Vine. I am an Amazon Associate. I was just going to comment about how sad the premise is (and frankly, pretty common if we’re honest). I find it a talent for a writer to pull off such a book without depressing everyone. I agree that the author must be very skilled to pull this off and not have it be a total downer. I am glad you enjoyed this book–I read it a few months ago and thought it was well done too. This sounds like a deeply emotional book, but I’d like to read it. I’ve been wanting to read this one. It definitely sounds like a book that’s for me! Great review! I’m definitely a fan of Moriarty’s writing and am looking forward to reading this novel as well. Thanks for the review! I’m glad you didn’t come away sad. That’s a good recommendation as far as I’m concerned! Oh good, I hadn’t read a review for this book yet, but I really liked Moriarty’s two previous books, so I was hoping that While I’m Falling was as good. I’ve had my eye on this one since I first heard about it. I read another book by the author a few years ago and really liked it. I am glad you enjoyed this one, Kathy. Thanks for the review Kathy…this sounds like one that I would enjoy. I’ve met quite a few women like the character’s mother and most of them are very sad indeed. They don’t seem to know what to do without other people to take care of. Glad the author could pull this book off without bringing you down. I LOVE this author and am so excited to hear she has a new book out! Thanks for the great review! I thought the husband was a jerk too!! I totally enjoyed this read! I’m going to add this book to my tbr list. It sounds really emotional but a very good read. This sounds good, and with kids about Veronica’s age, something I might be able to relate to. Except for that part about cheating on my husband! This book sounds so realistic. I am glad to hear you enjoyed it. I enjoy emotional reads, will add to my TBR list. Great review. Glad you liked it. Divorce is always messy and this sounds like it accurately portrays it. This one sounds interesting. I think it’s pretty common for someone Veronica’s age to be self-absorbed – you’re still trying to figure yourself out, let alone everyone else. Thanks for the review. I like family dramas, so this book would probably be something that I would enjoy. It does sound a bit sad, but since you say that it’s ultimately hopeful, I think I will probably look it up. Great review and thanks for the suggestion! I read one of her other books and although it was not a happy book, I found it to be pretty spot-on as far as emotions and character development. A family falling apart is such a tragic thing. Great review! If in the right mood I think I would like this one. This is probably not the light holiday reading I’m feeling drawn to right now. But I will keep it in mind for the dreary January 🙂 Excellent review. This one is on my wishlist and I really enjoyed her last book. Family issues seem to be a common thread in this authors books. I’m glad to hear that you liked it. This sounds like a lovely book, thanks for the great review! I haven’t read any books from Moriarty. It sounds like she’s good at portraying realistic characters. And sadly, many kids have to confront their parent’s divorce. The fact that they’re already adults when it happens doesn’t necessarily make it easier. Glad it ended hopeful! I agree, this one sounds very realistic. I’ll have to keep it in mind. I have seen this book in a few different places and wondered about it. I was happy to see your review. The book sounds sad but I think, unfortunately, that it’s a rather common story. I’m interested to read it because you’ve sad that you didn’t feel sad when you finished the story. Thank you for a very good and intriguing review, Kathy! I don’t mind sad in parts; it makes the characters (and their situations) more real to me. I have Laura Moriarty’s THE REST OF HER LIFE sitting here waiting to be read … maybe I’ll go on a spree and read all her books. Sounds like it is a bit of a depressing but realistic read. I like realistic books. Thanks for the review, Kathy. I’m glad it projects hope at the end of it. I wouldn’t mind reading this as I’ve read another of hers and really liked it. I read “The Rest of Her Life” by Moriarty, and it was pretty good. I’ll keep this one in mind. I’m a fan of this author, so I’m glad to hear you enjoyed the book. It’s one I’m looking forward to in 2010. This sounds like a great read. I’ll add it to my TBR list! Well this book kind of sounds like the story of my life. I feel like growing up and finding my place in the world has pretty much been the center of my attention. So much so that I didn’t really realize all of the deep rooted problems in my family until it’s too late. And it’s a painful experience – I’m still in the middle of it all not really sure how everything will turn out. But I think that you have to just hope for the best but still prepare yourself for the worst because anything can happen. Wow, sorry, that was kind of a vague information dump but this book really appeals to me and I guess I got a little carried away. It’s so easy to do here.